IT BEGAN WITH AN EMAIL. The letter landed in the inbox of John C. Mazziotta, MD (RES ’81, FEL ’83), PhD, CEO of UCLA Health, at 6:57 a.m., on December 5, 2016. It was an appeal on behalf of a young woman in San Antonio, Texas, with cystic fibrosis whose lungs were failing as she entered the end-stage of her disease. Doctors treating her at Brooke Army Medical Center told her parents that she was too ill to be a candidate for a potentially lifesaving lung transplant, and they should begin to plan a funeral for their 24-year-old daughter. Dr. Mazziotta forwarded the email to Abbas Ardehali, MD (RES ’97), surgical director of the UCLA Heart, Lung, and Heart-Lung Transplant Program, for his review and consideration. Four hours after receiving the email from Stoces, Dr. Mazziotta wrote back that Dr. Ardehali wanted to contact Kathlyn’s family and her physicians to obtain her records for further evaluation and to talk about taking her case. One week later, on December 12, a C-130 Super Hercules transport of the U.S. Air Force’s 59th Medical Wing lifted off from Joint Base San Antonio-Lackland with Kathlyn, her parents and a specialized pulmonary-care team on board for the four-hour, 1,200-mile flight to Los Angeles and Ronald Reagan UCLA Medical Center. 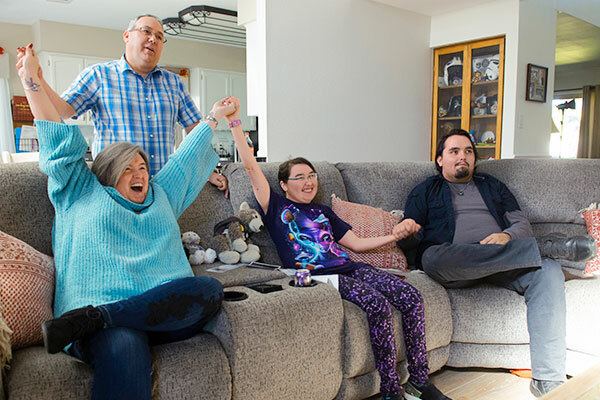 TO START THE JOURNEY THAT WOULD BRING THEIR DAUGHTER TO UCLA, Kathlyn’s parents Chris and Julieann tapped into a community of friends that had developed around Kathlyn’s love of Star Wars and a desire to raise awareness about her disease. Beginning at age 7, she started going to fan conventions and meeting celebrities, sweetening her introduction with a cupcake frosted with the letters “CF.” It was at such a gathering that she met Peter Mayhew, the 7-foot-2-inch-tall actor who plays Chewbacca, the hirsute Wookiee in the Star Wars franchise, and his wife Angie. They became friends, and the couple gave Kathlyn the nickname The Littlest Wookiee. When Kathlyn’s lungs began irretrievably to fail, her mother’s first thought was, “We just need one doctor to say yes.” She turned to “Uncle Peter” and “Auntie Angie,” hoping that their star power might help to reveal that one ray of hope. The Mayhews began a social media campaign, and they reached out to Stoces, a NASA contractor in Southern California whom they had met and befriended a decade earlier. “How could I not throw every energy and breath into trying to make a miracle manifest itself,” Stoces says of his reaction upon learning of Kathlyn. Stoces emailed Dr. Mazziotta; Dr. Mazziotta contacted Dr. Ardehali; Dr. Ardehali and his team reached out to Kathlyn’s doctors in Texas; and Kathlyn came to UCLA. WHAT BEGAN AS A CRY FOR HELP IN THE WILDERNESS culminated five-and-a-half weeks later, on January 11, 2017, when Kathlyn walked out of Ronald Reagan UCLA Medical Center with a new pair of lungs and the hope for a full and bright future. But the story does not end there. As a personal thank-you, Stoces planned a special tribute. 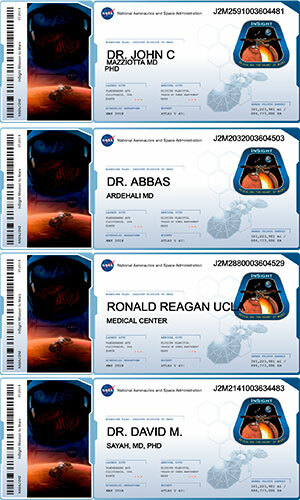 He arranged to have the names of Ronald Reagan UCLA Medical Center, Dr. Ardehali, Dr. Mazziotta, and pulmonary critical care specialist David M. Sayah, MD, PhD, associate director of UCLA’s adult cystic fibrosis program, etched onto a dime-size disk that would be on board NASA’s InSight spacecraft as it hurtled through 300 million miles of space toward a landing near the equator of Mars. At the same time, Kathlyn and her family watched a live stream of the landing from the comfort of their living-room sofa. 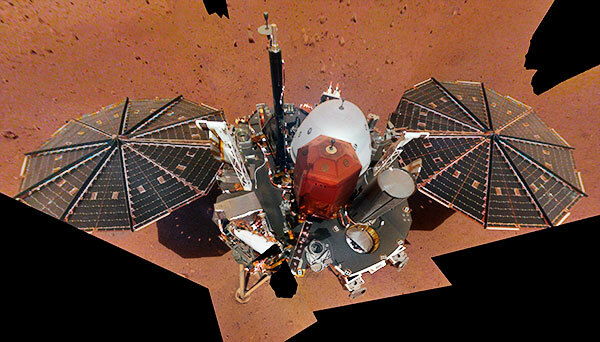 Their names, too, were etched on the InSight craft. As a voice from mission control called out the final moments of the landing — “Telemetry shows parachute deployment.” “Radar powered on.” “The radar has locked on the ground.” “Altitude 600 meters.” “Altitude 400 meters.” “300 meters.” “200 meters.” “80 meters ... 60 meters ... 50 meters ... 30 meters ... 20 meters ... 17 meters.” “Standing by for touchdown.” “TOUCHDOWN CONFIRMED!” — shouts and cheers erupted and a jubilant Julieann shouted “We’re on Mars!” as Chris texted “Congratulations!!! !” to Stoces. TODAY, KATHLYN IS AN OUTGOING AND EFFERVESCENT WOMAN of 26 who does not hesitate, when asked, to climb into her custom-made Wookiee suit. She dreams that one day a Martian will come along and read her name on the lander. “Sometime in the future, they’ll find it and say, ‘These people were here first,’ and, hopefully, they will name streets after me,” she says, with a wide smile. Angie Mayhew, who is vice president of the Peter Mayhew Foundation, which provides assistance to families of children undergoing medical treatment, recalls first meeting Kathlyn at a fan convention in 1999, when she was 7 years old. “She was this teeny, tiny girl and was so cute sitting in Peter’s lap while he signed autographs,” she says. In addition to being a fan, Kathlyn wanted to raise awareness of cystic fibrosis, a progressive genetic disease that causes persistent lung infections, by enlisting the voices of celebrities she met. Their friendship continued, and Kathlyn’s community expanded to include dozens of Star Wars fans, including members of the 501st Legion, a group that wears costumes to promote Star Wars films and events. Angie Mayhew recalls seeing Kathlyn at a convention in Houston in October 2016. Although Kathlyn was not doing well, she was able to sit in the Mayhew Foundation’s booth to interact with the public. Still, it came as no surprise to Angie when, six weeks later, Julieann reached out for help. “Julieann said, ‘All the doctors have turned her down. We just need one doctor to say yes — that he will at least evaluate her,’” Angie recalls. That conversation led to a Twitter and Facebook campaign and outreach to their friend Stoces. When Dr. Ardehali and his team said “Yes,” a new chain of events began to bring Kathlyn from Texas to California. An online fundraising campaign was launched to help cover the expenses that would be associated with her surgery and hospitalization. Kathlyn’s father is a chief master sergeant in the U.S. Air Force, so, as a military dependent, she was eligible to be flown to Los Angeles on a military medical transport. The team that accompanied her included 20 skilled specialists to monitor Kathlyn, as well as the complex equipment, which included a life-sustaining ECMO (extracorporeal membrane oxygenation) machine. It was December, which is a busy month for the Chassey family. Kathlyn’s birthday is December 3. Then there is Christmas, followed by Chris’s birthday on December 26. With Kathlyn in the hospital, he celebrated his birthday at a Japanese restaurant, in honor of his daughter’s favorite cuisine. But the party was a somber affair. That is until Chris concluded a silent wish for his daughter to get new lungs and blew out the candles on a piece of birthday cake — and his cell phone rang. The screen showed Kathlyn was the caller, but that wasn’t possible, Chris thought. Kathlyn had a tracheostomy and could not talk. Unknown to her parents, a nurse had been teaching Kathlyn how to speak — albeit hoarsely — in spite of the trach. “I got new lungs,” she said in a soft and gravelly voice, informing her parents that there was a donor. Back in the hospital, Chris and Julieann waited with their daughter. At around 5 a.m., Julieann heard a member of Kathlyn’s medical team say, “The lungs are viable,” and she and Chris watched, with a mixture of hope and fear, as their daughter, clutching a stuffed wolf that was a gift from her boyfriend, was wheeled to the OR. THE DAY AFTER KATHLYN GOT HER NEW LUNGS, members of the 501st Legion came to visit her. Kathlyn says that she insisted they first spend time with children in the hospital. “I remember being a kid and being hospitalized and bored, with nothing to do. I couldn’t interact with those kids (post-transplant), so I directed the 501st to go do that.” Chewbacca and a number of Star Wars Storm Troopers brightened that day for many of the hospitalized children. She also drew deep breaths to “taste” the air. BACK HOME IN TEXAS, Kathlyn and her family stay in contact with members of her medical team. She now has functional lungs, but must contend with other medical issues like diabetes and hearing loss. She can’t eat uncooked foods like sushi — a big disappointment for her — or leftovers that have been reheated too many times. Even so, she is doing remarkably well. 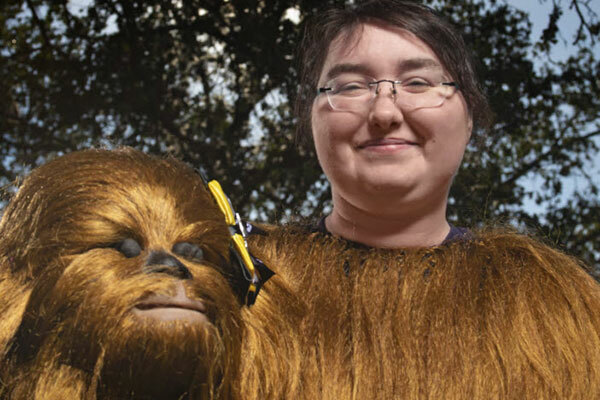 At just under 5 feet tall, she slips into her Wookiee costume — complete with head and feet — to entertain at fundraisers or children’s parties, a Mini-Me version of the 7-foot-2-inch-tall Mayhew in his Chewbacca getup. Still, there is something she wants to do, but she can’t quite figure out how: to write a thank-you letter to the family of her lung donor. She is struggling over what to say, Julieann says. It is daunting to try to say thank you to a family who has lost a loved one but had the generosity and grace to donate that person’s organs so that she may live. Her mother’s phrase “all we need is one doctor to say yes” has been replaced by “never tell her the odds.” It is not easy living with a transplant, but, with grit and humor, Kathlyn keeps fighting. “She’s stubborn,” Julieann says. Susie Phillips Gonzalez is a writer in San Antonio, Texas.